The Jungle garden is probably every customer’s nightmare - it doesn’t matter how many times you look at it, it never seems to get any better. Whether you have a overgrown garden the size of a matchbox or a couple of acres, Stone Valley will be happy to give you a written quotation and advice on clearing your jungle and giving you your garden back. 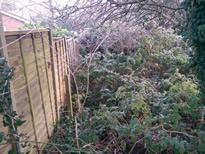 Our photo gallery features just some of the many 'jungles' that we have cleared for our customers.